The Yankees have declined to offer arbitration to free agents Johnny Damon, Hideki Matsui and Andy Pettitte. The Yankees also didn’t offer arbitration to Jerry Hairston Jr., Eric Hinske, Jose Molina and Xavier Nady. If the Yankees had excepted arbitration on any of the players, they would have been considered signed with an amount to be determined in the arbitration process. The Yankees can still negotiate with any of these players. Was this a good choice of a bad choice? Lets take a look. All of these players would have gotten raises in the arbitration process. 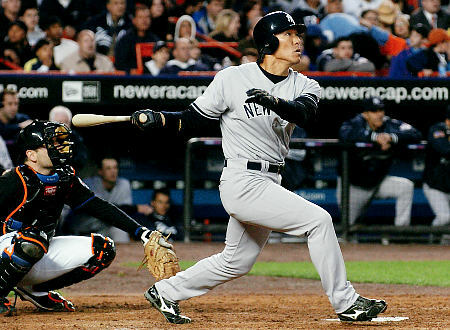 The Yankees don’t need Matsui anyway. The Yankees don’t get draft picks if any of these players sign anywhere else. Was this a good or bad choice? It was a great choice. Why was it a good choice? Lets analyze that for each player. Damon: The Yankees are likely to resign him. He had such a good year that he would have gotten a raise that his age doesn’t merit. He wants to play for the Yankees, so the Yankees can get him cheaper. Pettitte: As I said, the only negative is that if they sign anywhere else, the Yankees won’t get compensation. As for Pettitte, that doesn’t matter, because in the twilight of his career, I don’t see him turning his back on the Yankees, especially after winning a championship. Matsui: This one is interesting. Of the three, he has the best chance of signing with another team. But for two reasons, it wouldn’t make sense to offer him arbitration. (a) the Yankees still don’t need him and (b) he would have made a killing in arbitration. The Yankees can get him cheap if they want him because he really wants to play for the Yankees. So, theres no sense in bringing him to arbitration where he could make probably triple what he deserves.